Visible light with the highest amount of energy (blue light) can damage your macula over your lifetime (if not protected) and will degrade your visual performance even when young and healthy. Blue light is significantly defocused and scattered in front of the retina, contributing to chromatic aberration and reduction in contrast sensitivity, each of which contributes to a deterioration in visual performance experience. 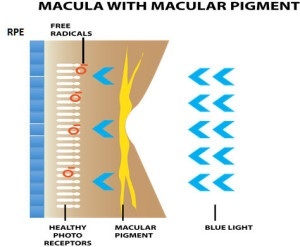 Macular pigment is uniquely positioned in front of the photoreceptors where it attenuates the effects of blue light, acting as a shield for blue light to enhance vision, and protect the underlying photoreceptors and RPE from the damaging effects of blue light.